my ATV (all-terrain vehicle) parked out back of Mansión de las Azahares, Las Playitas, B.C.S. Today I rode my ATV over to Catia's house to meet her for a Saturday afternoon in Todos Santos. Catia Asirelli de Melandri has been living off-grid in the Sonoran desert for the past 14 years with her husband, Paolo, since closing their restaurant in Marina di Ravenna, Italy. In the year that we've known them, Kevin and I have become enamored of their lifestyle -- a life centered around good food + good friends. We've had countless meals at their casa, first-class dinner parties that prompted our invitation to Catia to host the gala dinner for our first workshop at Taller de Terreno (TDT). scheduled for January 2019. Catia had three stops planned for us: a pop-up shop of two collaborating artist-friends of hers, Rancho Buen Dia for ensalada, and, as always, Mercado Del Sol for anything left we'd forgotten. The day, like most here, was stunningly sunny and warm, with an ocean breeze arriving right on cue to cool down the sizzling sandy camino to our first destination: the studio of textile designer and artist, Javier Lario Díez. Just back from Spain, Javier had immediately reunited with collaborative partner, painter Gloria Santoyo Ruenitz. This would be only their second line of garments designed and produced together, and as we entered the breezeway leading to the detached studio building, I could see the airy, contemporary fabrics blowing in the brisa. Catia zeroed in on a hand-dyed indigo table covering of organic cotton, and I was drawn to the loose-fitting pants created by Javier and dashed with Gloria's signature zen brushstrokes. Instead I bought a white cotton shift dress with Gloria's free-handed, generous om symbol as a not-so-subtle reminder to myself (and others!). Off to the mercado with us. I changed into the dress -- no time like the present -- ommmmmmmmmmm! Ranch Buen Dia, really just a covered stall, or palapa, in front of a small, organic vegetable farm, had their fabulous Super Food greens, but no tomatoes. And while Mercado El Sol has almost everything you can think of (disclaimer: for a small village in Mexico), produce is bought there only as an afterthought. "El Sol Dos", as the locals refer to this their second location in town, is more for leche, huevos, totopos and cerveza (ALL important words en Español ~ better look them up! ), and is usually jammed up at the register with touristas counting change. Three stops turned into four. Only in-season fruits and vegetables are sold here, and tomato season had apparently just ended "What!? Already?" (me, shocked). "Too hot now," came Catia's quick reply. I felt pretty lucky that our maestra was able to find suitable specimens at all for the meal she had planned for tomorrow, since there are only a few markets in and around town selling produce, and we'd gone to two of our trusted standbys already. 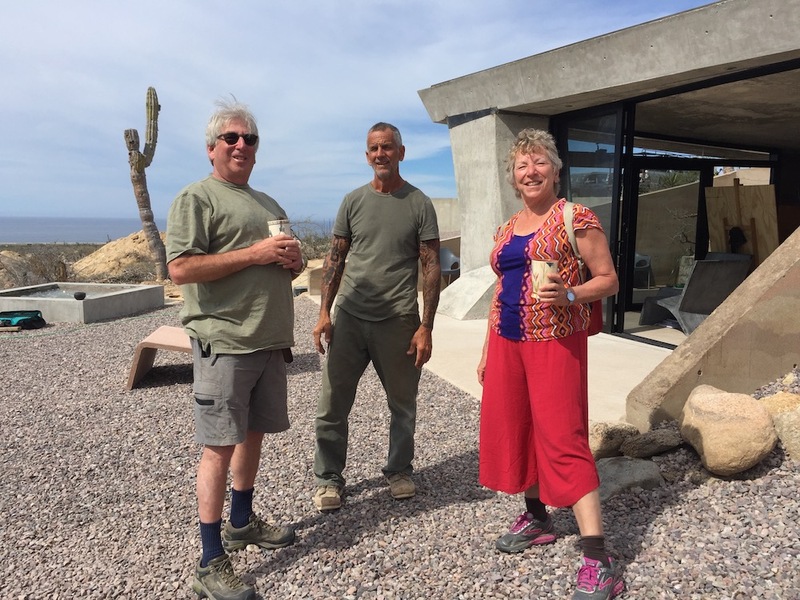 We had success at the fourth stop, and soon were bouncing back up the washboard road to Las Playitas, five miles north of Todos Santos. Traffic report: two horses and a mule moving slow up ahead, small herd of cattle + one bull at the final bend near the Cota family ranch house. By 7:30 we arrived, hungry, at the property of Hotel San Cristobal. Paolo and Kevin led the way down the candlelit path to the ruins of an antique abalone cannery. The event promised all-you-can-eat chef specials, prepared on the spot, and bottomless wine glasses, so Catia and I had to hustle in heels through the beach grounds to keep up with the men's party-pace. The sounds of thumping live reggae music mingled with charcoal grill scent, and after snapping a few quick photos I quickly made my way to the food. Hanging lights, people everywhere, small plates lining the tables and bar. Didn't take me long to draw a mental map of the place: traffic this way to bar, get in line with a plated salad while waiting for soft, delicate white-fish tacos topped with fermented cabbage salsa; eat salad while waiting, grab another on way back to table, try the fresh corn tortilla with the rice. 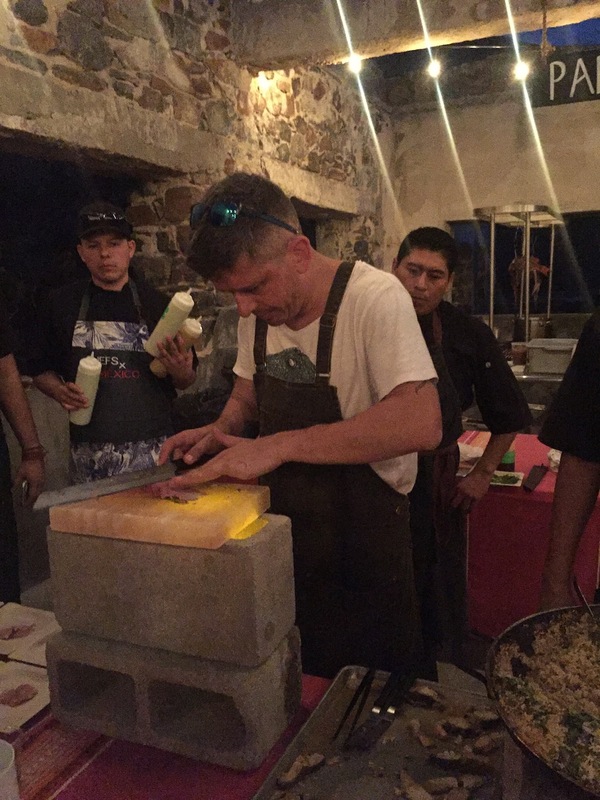 Chef Alberto Collarte is from Santiago, Chile, but now lives + cooks in Cabo San Lucas. We were all eager to taste his creations for tonight's menu, "inspired by the ocean's offerings," as the hotel's handbill proclaimed. My favorite was his curel, or yellowtail, sashimi prepared on a Himalayan salt block (lit Hallowe'en-style from below) and garnished with a creamy citronette. I could taste a hint of salt on my tongue, balanced with sweet fish and more complex acidity of the citronette. The evening ended with a round of group photographs + cheering from the chefs + sous-chefs. Mexicans know how to celebrate, I assure you. As mentioned earlier, I wore my new dress from the pop-up, and I couldn't help but notice more people smiled at me while I was wearing white...or maybe it was the Om sign? My night was lit in many ways, the sparkle of the candles was contagious, and we all drifted into the night. Kevin and I wandered down to the beach through San Cristobal's Hotel + pool area, a palmy environment centered around the largest swimming pool I'd seen yet in the Todos Santos/ Los Cerritos Beach area. Couples still sipped drinks in the pool's inner sanctum of twin jacuzzis. The darkness enveloped the coastline, but the pull of the tide was ominous from so close to the ocean's edge. It was hard to leave its overwhelming presence and get back into our truck. Kevin + I arrived at Catia's at 2pm sharp the next day, so as not to miss the fresh focaccia from the oven that ~ Catia had already messaged to tell me ~ was going fast among the foodies. Pasta with tomatoes and the last of this year's reserve of bottarga (the Italian name for a delicacy of salted, cured fish roe) was plated after an appetizer of pargo carpaccio, fresh red snapper. Taller de Terreno (TDT): Where were you born, and were you raised in this same city? Catia Asirelli de Melandri: I was born in Ravenna in Emilia Romagna, Italy, and raised in the same city. I moved from Ravenna when I was 18. TDT: Who or what meal is your earliest memory of influential cooking? Catia: My grandmother Adele with her love for food. She made Emilia Romagna traditional cuisine as Lasagne with truffle (her masterpiece!) or Passatelli in fish broth (you can eat that delicious homemade pasta only in Romagna). Actually, I'm not a traditional Italian chef, but I learned from her that to make good food I need fresh ingredients, time, a good vision of the life and love. Thank you, Nonna! TDT: Did you always want to be a professional chef? TDT: How many restaurants have you owned, and where? Catia: I owned 2 restaurants with my husband: Miraflores in Ravenna in 1982, it was the first restaurant in the city serving tapas. It was inspired by our trips to Spain and Morocco. I used to take inspiration from our trips [taken] in the winters when the Beach Club was closed. Every summer we had new dishes, everything fresh and homemade, the menu' wasn't written on paper but it was sung by the beautiful young girls at the table because the menu changed so fast -- some days from lunch to dinner, depending on the fresh ingredients we found each day. In 1992 I spent almost 2 years in Santa Monica, California, having fun cooking and managing a few restaurants in town. The funniest experience was in an Italian Restaurant (I don't remember the name), I made ONLY side dishes (contorni in italian) and everybody called me 'the contorni woman'. I prepared 25 different side dishes using only fresh vegetables, I was in the middle of a round table making them with a waiter serving them directly from the table. TDT: What was your favorite dish on the menu? Catia: Spaghetti alla Bottarga, Carbonara Fish Spaghetti (my personal version of Carbonara with fish instead of pancetta), and a delicious Fish Curry. TDT: How long have you lived in Baja Sur? Catia: I came here the first time in 1992, I was working in Santa Monica (CA) and my husband come to visit me from Italy. We decided to spend a vacation of one month in the Baja Peninsula, then we began to come every year for a few months. We moved here as residents in 2005. TDT: Where in the world would you like to go to sample local fare you've never tried? Catia: I'd like to go to Indonesia, Japan and Vietnam to taste the food and to learn more. We scheduled this trip for the end of next year. TDT: What do you like best about Mexican cuisine, and how have you adapted your Italian recipes to reflect your new culture? Catia: The sauces, the maíz tortillas, fish tacos and the fantastic seafood dishes. The Mole is a masterpiece, it's an ancient and ancestral recipe of the Oaxaca region cuisine, my favorite place to eat in Mexico. When I come back after a long trip outside of the Mexico I like to eat Sopa Azteca because it has all the flavors of Mexico! TDT: How + where did you become friends with Chef Alberto Collarte (of Buena Pesca? Catia: I met Alberto 5 or 6 years ago in my house. I went to a dinner with my girlfriends and when I came back at 11 pm I found Alberto, his friend Mauricio from Chile, and Cristian, a young Italian chef working in Cabo San Lucas. Mauricio wanted to start a wine business here, and Cristian knew that an Italian man in Todos Santos made wine -- he got Paolo's phone number from a common friend in Ensenada. That afternoon Cristian called Paolo asking advice about how to make a wine business in Baja. Paolo asked him where he was, he said, "Right now I'm in La Paz with a friend who wants to start a wine business and another chilean friend, a chef and we'll go back to Cabo around 5 pm. So Paolo invited them to stop to our house on their way back to Cabo giving him the directions to come through the desert. You can imagine their surprise and happiness to arrive at our house from a road they didn't know, it was autumn, the desert so green, and they arrived for the sunset! They fell in love with Las Playitas and we became good friends. After 2 years, during a Sunday lunch here, they bought a piece of land next to us: Paolo called a lady who was selling it and they decided the price and bought the land by phone! That night I met them they were enjoying Fior diVino [Catia + Paolo's own wine] and they hadn't eaten yet so I made for them the fantastic Bottarga Spaghetti at midnight. They were the happiest guys of the Baja California that night ~ and a new friendship was born! Pura Vida! Gracias, Catia y Paolo! Catia Asirelli de Melandri will be cooking one very special meal for the close of Taller de Terreno's kick-off workshop (coming January 7-18, 2019). She assures us she will return to Italy this summer to get more Bottarga. Spaces still available for the workshop. Reserve your space HERE now. Waking up your first morning in Baja, you open your eyes and turn your head to glimpse outside your B&B window bright cerulean blue, cloudless skies and an ocean-horizon line edged with palms + cactus. Somewhere a dog is barking, roosters are crowing and you feel the pulse of that Pacific pounding. Bienvenido a Todos Santos! You’re due at La Esquina by 8:30, so why not head there early for some huevos rancheros, cafécita and fresh-squeezed jugo de naranja? Free WiFi means a great chance to post a few pics of the drive up from Cabo while having desayuno, and the rumor is that TDT asks you to “unplug” (the rumor is true!). Part of the TDT experience is, after all, to get back in touch with nature. There will be plenty of time to catch up with Instagram later, after a physical day of arranging bricks, making pots, exploring the desert and beaches, and of course, eating tacos and sampling a few local Mezcals! La Esquina is already hopping by 7:30am. Mexicans, Gringos, Euros, they’re all here milling about with colorful terra-cotta mugs and cell phones in hand. Counter service offers you the chance to quietly observe an entertaining line-up of local characters chatting comfortably with one another at the often-shared round tables. You opt for the gluten-free pancakes (con blueberries, of course) and settle down to deal with a few emails. (Buh-bye email after today, mañana you’ve forgotten it exists.) At 8:30 the TDT jittany arrives and you pile on-board with your seven, kiln-building cohorts. The 5-mile ride to Taller de Terreno is the perfect way to wean off that Internet. Who can look at the phone when the scenery steals the show like this? Ocean for miles, and only one long beach road to travel. You bounce along, the washboard road being impressively wide, yet unpaved. The only traffic you encounter along the way is a small but stubborn group of cows who refuse to give up their piece of the camino. The jittany nudges its way gently through, and the cows go back to their chewing on dusty green scrub. Just before 9am, this desert rig on which you’ve been perched (you chose the flip-down back seats for the adventure of it) pulls in through a rammed earth and steel gated entrada and makes its way down the driveway. The view catches you off-guard: a dramatic landscape of ocean, desert and the show-stopping Sierra Laguna Mountain range. Here in perfect view is what the indigenous people have named The Sleeping Giant. It’s easy to see how he sleeps. This tropical desert scene is muy tranquil, the town of Todos Santos visible as a neat line of low buildings just on the other side of the vast dessert-arroyo, with not much else in between but a few farm houses. After lunch the class gets back to work. The new kiln site is tucked within the terrain in such a way that, like the other buildings at TDT, it can’t be easily seen. TDT aspires to integrate its structures into the landscape so that they seem to grow there, rather than intrude upon the natural environment. Cast-concrete and compacted earth walls emerge from rocky dips and rises of the desert terrain. Rooftops are weather-proofed and landscaped with living desert gardens. The entire rancho is solar-powered with grey-water collection for agricultural use. A walk around the grounds is more like a hike, with 7 acres of densely packed cactus and thorny brush, torote trees, rabbits, rocks. A little later on, you decide to venture off into the arroyo to hunt for bones, first memorizing your orientation in relation to the orange roofline of the only neighbor in sight. With the ocean, mountains, and that rooftop in your mind’s eye, you pick your way down the cow path into the mystery of the sandy dry-river bed. A cowbell is faintly ringing somewhere, coming closer or maybe only brought closer by the ocean breeze. When you rejoin the group at the kiln site, you take a turn at the brick saw and impress yourself with your steady hand — your focus is better than usual, you notice. By mid-afternoon the urge to take a siesta is curbed only by TDT’s intervention in the form of bliss-inducing brownies AND blondies from local favorite café and pastería, Taller 17. Coffee or afternoon tea is a favorite of both Tallers! Once revived, you finish out the workshop day watching Maestro Doug Casebeer move clay on the potter’s wheel with a familiarity that inspires you to practice. !Nunca supe cuánto amo a los animales ... ¡especialmente a los caballos! And I did, in fact, get corralled by my Uncle Fred + Aunt Kay into getting on a horse that hadn't been ridden in YEARS at their Pennsylvania farm a few summers later. That wasn't a very smart idea on someone's part. I was quickly bucked off the poor nervous animal, who threw me into a hardened cornfield after dragging me along on it's side a few too many strides when it bolted. Yeah yeah yeah, I got back on it for that symbolic moment that finally satisfied my Aunt and Uncle ~ but that was it for me and horses for a while, especially when I next discovered rocketships, and after that, ceramics. Who has the time or money to keep a horse, let alone ride and groom it properly, anyway? Now on my morning walk around Todos Santos's outer villages I find a menagerie of breathtakingly somber horses standing tied to trees along the dusty and often garbage-heaped streets. I can't bear seeing them confined on short leads in abandoned lots with almost no vegetation, certainly no water, and no shade cover for hours ~ for some, days. All this in the dead of summer in the desert heat of Mexico? Now I take my morning walk with bags of watermelon scraps and cantaloupe rinds, carrots, and apples. I look for as many tied-up horses as I can find in an hour, spreading the fruitarian love around the neighborhood. So far, I've met Estrella (Star), her mother Fresa (Strawberry) who's expecting another foal this Christmas, I can hardly wait! ), Amigo (Friend), and another lovely unkempt brown horse who, I'm told, doesn't have a name. The one I love the most is a creamy white, also unnamed. I've named her Leche (Milk) and she whinnies now when she sees me coming. It makes me tear up every time! Now I've learned from mi vecina (thanks to my beginner Español class, that Leche is actually an identical TWIN! I was shocked! So now I have no idea if I've bonded with uno o dos caballos blancos, so just in case, I've named the second girl, "con Leche" (with Milk). It would be a Christmas miracle (Santa, are you listening?) if I could acquire Leche-con-Leche both para nuestro futuro rancho...a gal can dream, right? It wasn't in our original plan to have horses at Taller de Terreno (Field Workshop). Now that I've dug out my work boots and leather whip (thanks, Daddy-O and "Nasty Nick's") and have begun researching amateur horse-training online, Kevin has started taking this little obsession of mine seriously. There's talk of buying more land after we sell my co-op space in Emeryville, CA. We could fence in a separate area to let the horses (what horses?!) roam free in the desert-ocean landscape. I could lead Leche con Leche by my whip's tail down the road to our land -- I'm KIDDING! I'd stop buying shoes the rest of my life to buy them! Wouldn't you?? Just look at these faces!! These two animals pictured above are actually being fostered by mi vecina, MaryAnn, who also claims to know nothing about horses, but simply had compassion for Estrella (left) who was attacked at birth by a pack of neighborhood dogs ~ la banda de perros. Her mother Fresa (right) is very protective of her, as is their foster mother, thankfully! Fostering means MaryAnn pays to feed, "water", and house (read: look after them in the empty "se vende" lot adjoining hers) these two animals year-round for nothing in exchange ~ well, there's el amor! I bring these two sweeties carrots for treats; they do get daily heno (hay), agua (H20) and un poco de sombra, but still they're always happy to see me on my way to the less fortunate caballos en el barrio. This "FriendsGiving" (Día de Acción de Gracias, en español), I am thankful to have connected with the seis o siete caballos I've met here in Baja so far. The thought of them literally gets me out of the bed in the morning when I'm in pain and feeling a little bit sorry for myself. When I see those horses pulling toward me on their ropes I'm reminded to count my blessings for comida, mi casa y mi libertad. I really am living the dream. At the bottom of this page you'll find a SUPPORT button that takes you to our donation page. You can buy a bail of alfalfa for these sweet animals and I will personally deliver it! 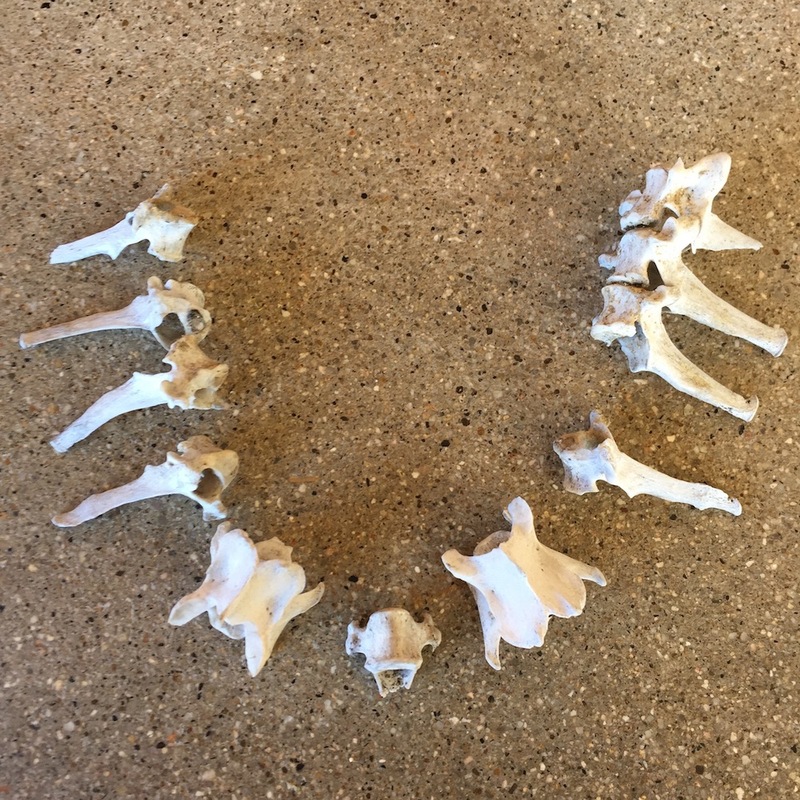 Stay tuned for more opportunities to help feed, clean, and house Baja's often-neglected or mistreated animals. Thank you very much. MUCHAS GRACIAS!